How New York Times bestseller was resurrected after falling casualty to political correctness. Joseph Farah and Barton deserve each other; both engage in historical revisionism. Farah says at the end of the WND article. Farah added: “Think about all the books that are published every year in America – many tens of thousands. Only one book that I know of in my lifetime has been censored by its own publisher after becoming a bestseller. Only one history book was so banned in the United States, to my knowledge – pulled from the shelves to ensure Americans couldn’t read it and make up their own minds about it. Many books published in America as non-fiction are made up out of whole cloth – and that includes history books with the most preposterous speculation and fantasies. In a free society, that is to be expected. What should never be expected is that controversial books with premises some might disagree with should be banned, spiked, burned or shredded. That’s exactly what happened to this book. And that’s why WND Books is bringing it back into the marketplace. Is it possible that Farah thinks he is telling the truth? I can’t see how. The book was never “censored,” nor was it “banned in the United States.” The book was not destroyed. WND is not bringing it back into the marketplace. The Jefferson Lies has been available from Wallbuilders since the rights reverted back to Barton after Thomas Nelson stopped publishing it (see this Wayback Machine link for February 2013). It is available now on Amazon and has been for years. In fact, it has been available since at least June 15, 2013 from World Net Daily’s Superstore (see this Wayback Machine link). Let that sink in. Farah said the book was banned and implied it was somehow not in the marketplace. He has been selling it since early 2013. There is two critical problems for WND’s theory about political correctness and Thomas Nelson: Thomas Nelson publishes many other conservatives and no other books have been pulled from publication during the same time period. I left a comment after the article and in it named several conservative authors which Thomas Nelson publishes, including a couple published by WND. Regarding WND’s accusation that Thomas Nelson pulled Barton’s book due to political correctness, please consider that Thomas Nelson currently publishes books by Jerome Corsi and Ben Shapiro. Thomas Nelson publishes Eric Metaxas’ highly regarded book on Bonhoeffer. Other conservatives published by Thomas Nelson include Richard Land, Judge Napolitano, Tom Coburn, William Bennett, Kevin McCullough, Star Parker, Sam Brownback and others. It makes no sense that Thomas Nelson publishes these authors but removed David Barton’s book due to Barton’s conservative ideas. The politically correct theory fails when one considers there is no pattern, no other book which was removed. Thomas Nelson conducted an internal review and came to the same conclusion as many external critics. No amount historical revisionism by Barton and WND will change what happened. Happily, there is an antidote to this revisionism. 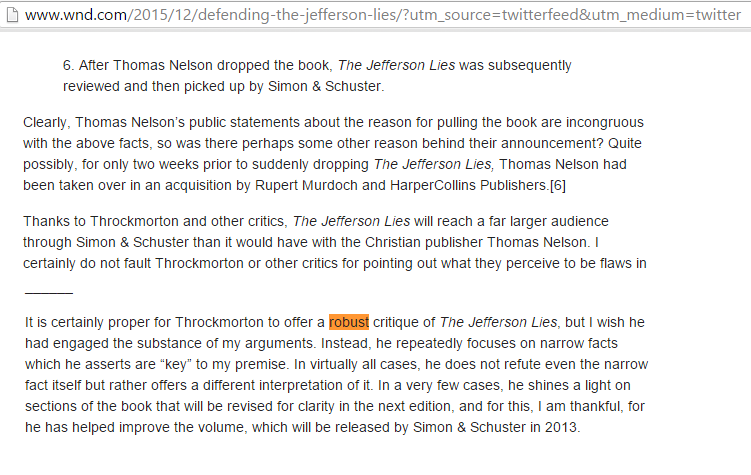 Yesterday, World Net Daily posted David Barton’s defense of his discredited book The Jefferson Lies. This is in preparation for a January release of the WND edition. The WND posting appears to be the same 40 page response he wrote in early 2013 in reaction to publisher Thomas Nelson’s decision to pull the book from publication due to historical errors. I asked Simon & Schuster earlier this year if there was any truth to this claim and the publisher’s representatives said the book would not be published by them. I wonder if WND will correct this error. Only four of the ten scholars contacted by Richards actually provided any critiques of my work: Glenn Moots, Glenn Sunshine, Greg Forester (sic), and Gregg Frazer. Of these four, only Frazer specializes in religion and the American founding, but his critique did not even address The Jefferson Lies, and it is not clear that he even bothered to read it. Instead, he watched and criticized a twenty year old video entitled America’s Godly Heritage. Moots, Sunshine, Forster and Frazer are all historians and they are all Christian (Frazer’s critique of America’s Godly Heritage — which is still commercially available — can be read in an earlier blog post). As I have demonstrated previously, there are more than a handful. Obviously, WND is hoping to cover up the facts. A large part of Barton’s response in his WND article is to bash me, as if what team he thinks I am on matters. It is a sign of a weak argument when you spend little time on the facts and a lot of time on the personality of the person bringing the facts. The effort also appears to be designed to distract readers from the fact that I have a co-author — political science scholar Michael Coulter — and have published the work of numerous Christian historians on this blog (e.g., here). Yes, it was shocking that Thomas Nelson did the right thing. And it is shocking that some Christians try to create an alternative reality in order to sell books and gain political power. 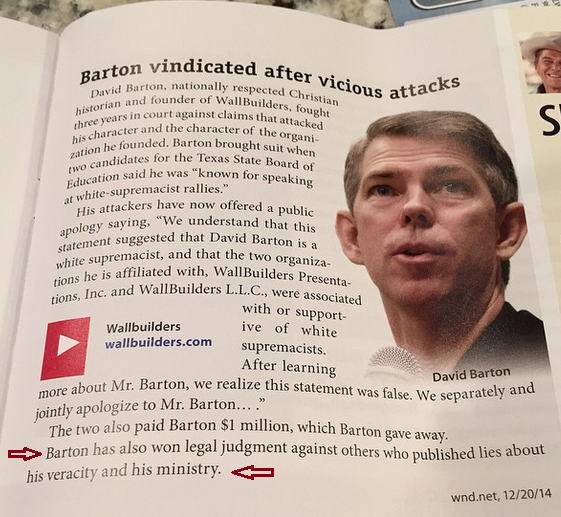 David Barton’s vindication campaign is getting some traction among far right publications. The newest American Family Association Journal ran a brief summary of the December 2014 World Net Daily article. The AFA article concluded with this unsubstantiated sentence: “Barton has also won legal judgment against others who published lies about his veracity and his ministry.” See below. So far, Mr. Aman is standing behind his story. I informed him that Parker County, TX public records disclose that W.S. Smith was dismissed from the suit in 2012. Aman responded that Mr. Barton was the source of his information about the disposition of the suit. Aman provided no response to the Parker County, TX records. Of course, even if a judge wrote those things, it wouldn’t place David Barton on the Oral Roberts University basketball team, or make his denial of progress toward an HIV vaccine true. It wouldn’t change the fact that he omits parts of quote from America’s founders that don’t align with his views, or that the Consitution doesn’t quote the Bible verbatim. Today, the far right website, World Net Daily, is accusing the President of using the Food & Drug Administration drug approval process as a way to ration health care via “death panels.” As evidence for the claim, this front page story by Greg Koprowski states that “new drug approvals declined dramatically last year” citing a drop in such drug approvals from 25 in 2009 to 21 in 2010. Although website claims the article is “breaking news,” the other evidence offered is a quote from a July 27, 2010 letter to FDA official Dr. Richard Pazdur from Senator David Vitter (R-LA) writing in support of the anti-cancer drug Avastin. The FDA recently made a recommendation to remove the breast cancer indication from the Avastin drug label. In the letter, Senator Vitter worries that the approval process may signal the beginning of treatment rationing. I spoke with Sandy Walsh at the FDA who called the claim that the FDA was using cost as a measure of approval “absurd.” She also noted that recent approvals are in line with past years. As a review of FDA data demonstrates, she is correct. For perspective, here are numbers of new medicines approved by the FDA from 2000 to the 2010 estimate. Mr. Koprowski called the drop from 25 new drugs in 2009 to a “mere 21 new drugs in 2010” a dramatic decline. Not at all. An examination of the approvals over time tells a different story. Clearly, Obama’s FDA is keeping pace with the record of the Bush administration. By reading WND, one would never know the rest of the story. Selective reporting is just one reason to question crying wolves at WND. Enter the Medicare death panel scare. In late December, World Net Daily published an article that said the Obama Administration was slipping death panels back into Medicare via a regulation defining patient-physician discussions of advance directive planning. Yesterday, the Obama administration rescinded that rule, in part because of the misinformation campaign waged by social conservatives. Nothing good can come of this,” said Judie Brown, the president of American Life League. “This will affect everybody’s parents and grandparents and preborn babies, and it will not affect anybody for the good. As I noted in a previous post, claims that the just rescinded Medicare regulation required doctors to persuade senior citizens to refuse care are just false. The new regulation was an extension of a definition of advance care planning which remains a part of the initial Medicare visit, a provision that was added by Congress in 2008. That bill was passed via override of a President Bush veto. The veto however, had nothing to do with end-of-life counseling, but rather concerns over cost. As far as I can find via search engines, there was no outcry from conservatives then over the end-of-life provision. No one cried death panels then. As an administration official told me yesterday, Medicare does not prescribe any conversation between patients and physicians about end-of-life issues. Patients are free to use pro-life resources and advance directives to plan their end-of-life care. The only reason the definition was included was to alert physicians that these conversations are important. There is neither a separate reimbursement for advanced care planning now nor would there have been if the rule, rescinded yesterday, would have remained viable. In the case of the advance care planning regulation, the scare tactics worked. The Obama administration backed off of a reasonable definition of advanced care planning, a practice that pro-life groups actually recommend to their constituents. However, hysteria and spin won out over good policy. In the case of FDA approvals, it is clear that there is no trend specific to this administration. At what point, do readers realize that those crying death panels are crying wolf?